The train leaves platform 2 at Aylesbury station, having come direct from London Marylebone. 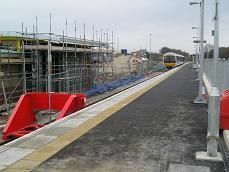 Until December 2008 trains terminated here, but with the opening of the new station at Aylesbury Vale Parkway, trains continue to that station. We go under a road bridge and pass the Aylesbury traction depot on the left, which has a few units in it. We then pass through an area of light industrial units and some out of town superstores. The track having been double now goes into a single track. We pass a newish housing estate on the right and then come out into the countryside. We go over a small stream and see the A41 on the right. Then we slow as we change tracks and come into the newly opened station, which is a single platform with a stainless steel, framed bus stop. Although there is a new roundabout that links the station with the A41, it is still in the middle of nowhere. All around us is a building site with the ticket office still taking shape. There are around ten cars in the car park, but I'm not sure if these are for the workers or commuters who have started to use the station. There are a lot of portacabins for the workforce, as well as housing a small waiting room and ticket office, which is closed. In fact it is only open between 7.00am and 9.20 am. I'm the only person to get off the train and am the only person to get back on it. It stays in the station of course, with the driver changing ends. I reckon it'll be another 3-4 months before it's fully completed.